The North West Coast has particularly outstanding scenery. The landscape you view today is the result of geologically recent surface processes acting on much more ancient underlying rocks. The oldest rocks to be found in the Lochbroom area are at Corrie and were formed about 3000 million years ago deep down in the earth’s crust at enormous pressures and temperatures. They are called Lewsisian Gneiss and are extremely hard, which explains why the Loch is narrower here as the ice that occupied the valley found it more resistant to erosion. The gneiss often consists of bands of light and dark minerals. There then followed a long period of erosion, and eventually the gneiss was brought to the surface about 1000 million years ago. It formed a hilly landscape with rivers flowing in valleys. Higher mountains existed where the Atlantic is today. These provided pebbles, sand and mud, which were carried by the rivers, filling the valleys and eventually burying the hills. As the sediment was deposited in layers and buried, it slowly turned in to solid rock, preserving these structures. The rock formed is called Torridonian Sandstone, which is dark red, mostly sandstone (made of sand) or conglomerate (made of pebbles and sand). About 570 million years ago, a warm sea gradually invaded the area eroding both the Torridonian Sandstone and the Lewisian Gneiss. First beach sand and then shallow sea sediment, consisting of mud and lime, were deposited along with some animal remains, which formed fossils such as trilobites. Also worm burrows are preserved as colour variations in the rocks. The lime formed limestone, which is quarried on the road to Rhidorroch and used mostly as agricultural lime, which is distributed all over the North of Scotland. The whole area was then involved in a huge mountain building episode as two massive continental blocks ran into each other. Folds, faults and intrusions of magna were formed beneath the mountains that were produced by this continental collision. They were probably on the scale of the present day Himalayas. This movement was completed about 400 million years ago. The story since then has been mostly of erosion, with rivers cutting valleys which were then deepened and extended by glaciers in the last half million years. This can be seen in the Lochbroom Valley itself. 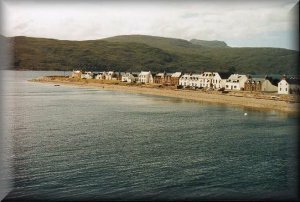 Changing levels of both sea and the land have formed raised beaches, two levels of which can be seen in Ullapool. 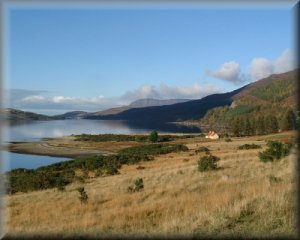 The upper one, (the elder) has most of the village of Ullapool built on it and the lower has Shore Street and the caravan park. The results of some of these momentous events can easily be seen around Ullapool. Standing on Shore Street and looking southeast along the length of the glaciated valley towards its head, the narrows at Corrie can be seen and the distant mountains of Beinn Dearg and the Fannich Hills. These mountains supplied some of the ice that flowed down Lochbroom and lie on the other side of a major fault, which was formed during the mountain building episode 400 million years ago. These mountains themselves, however, were only uplifted much more recently. The valley was flooded at the end of the last ice age to form a sea loch. The rocks immediately on the other side of the loch to Ullapool are red Torridonian Sandstone; the layers in which it was deposited are almost horizontal and are visible from here in good light. Any major vertical lines you can see are probably faults, which provide planes of weakness for erosion to exploit. Most of the older houses in Ullapool are built of this dark red sandstone. The road cuttings on the Dingwall road towards Corrie give the opportunity to see some of the rock types mentioned. Starting in Ullapool, the red Torridonian Sandstone exists by the footpath before you reach the Four Seasons Hotel. Opposite the Four Seasons the white/grey sandstone marks the first rock deposited as the sea invaded the area 570 million years ago. Over the first bridge, this rock continues until the top of a road cutting shows a younger rusty brown mudstone formed in quieter waters. The white/pink sandstone below shows worm burrows here but the rock face is not very stable and should not be approached. The limestone appears at the bottom of the next road cutting as a grey coloured layer with a low angle fault above it, sloping at about 15 degrees eastward. This was one of the faults formed in the major mountain building episode.